The spacious rooms and pool areas of the Coronas Playa Hotel make this an excellent choice for a relaxing stay. All Inclusive is an option, but if you take it up with he Hotel on arrival, I felt 23 Euros a night (each) was a little excessive. Location is about a brisk 10 minute walk to the resort centre along a seaside promenade, where a variety of shops/restaurants/pubs can be found. Hotel tip: Nice little bar in the next door complex - Playa Bastian On our first visit there our drinks order got forgotten and eventually arrived with profuse apologies, which was then followed by a refusal to accept any payment due to their lapse. First of all, the hotel Coronas is classed as a 4 star but I think it’s more a 3+. Little things like no bidet, soap, only shampoos in bathroom, no tea/coffee making facilities, writing paper ect the bed sheets had holes in them, saying that the rooms were quite large and the maid kept it spotless. The food in the restaurant was quite good a good selection of meats fish veg etc. but sweet selection was very poor as was the cheese table only two types of cheese and only cream crackers. The staff in all departments were fantastic from front desk, restaurant, bars, cleaners, even the gardeners all had time to chat and always smiling. All said we had a lovely stay in the Coronas Playa. Unfortunately the hotel by comparison to other hotels recently visited does not, in my opinion, live up to 4 star status. The sunbeds are looking a little tatty and the few replacements are hard plastic, they do not have any cushions on the hard wicker seats in the dining room (they pass a few around according to what time you arrive at the restuarant), the food is well presented and palatable but lacks variety and has limited choice. The beds are hard and uncomfortable and the sheets and blankets provided appear to be somewhat aged. I have been to this hotel on several occasions over the last ten years and can honestly say that it has changed beyond all recogniton since my last visit two years ago. It is in need of a revamp and some tender loving care. The entertainment crew tried hard but the evening entertainment was adequate and was limited to tribute bands and acrobats. It is unlikely that I shall ever return to this hotel. We emailed the hotel before arrival and asked for a room with a south facing balcony,,, we were given room 624,, over looking the top pool and ideal,,, sun from early morning til late evening, The rooms are all huge as are the balconies.. The food cannot be faulted.. excellent and massive choice at every meal time ,, and snacks available by the pool bar if you re a bit peckish. Although we and a lot of other guests were all in clusive,, it was noticed that a many people still tipped the waiters and waitresses,,, they work very hard,,, long hours and always a smile for everyone . The cats are still in residence at the hotel,, they ve been there for years now and many guests feed them on the quiet,, ourselves included,, although one particular couple were very annoyed with us for doing so,,, if the cats were a problem at the hotel then the management would have dealt with them ?? Live and let live !! We went half board and the food was lovely a great choice everyday. The hotel was the cleanest I have ever stayed in. The location of the hotel wasnt great but you could walk to the town in about 20 mins very windy though. The hotel staff couldnt do enough for us very pleasant. The entertainment team really do try very hard to keep everyone happy there was something going on during the day by the pool and in the evening.Our room was huge and we had a great view of the pool and the sun on our huge balcony from about 11.00 until the evening that was lovely. I emailed the hotel 2 weeks before we went and requested a high room with a southerly aspect and they did us proud I would recommend room 624. The Hotel was kept immaculate and clean. Reception staff were excellent. Maids etc. did a first class job. Sheets, towels changed as and when required. Food was of quite a good standard. Especially enjoyed breakfast. Evening meal was good but did have some strange combinations but we tried them all and enjoyed most of them. Restaurant staff were very good and attentive to your needs. We emailed before the holiday to request mattress toppers and a high level room with a pool view. We got both and room 626 gives excellent views of the pool and the sea and the balcony gets the sun most of the day. The room was very big and as we have said kept immaculate. Plenty of toiletries supplied in bathroom. The entertainment was a bit hit and miss. The Thomson team did their best but quite frankly little of it appealled to us but others thought it was great. So it all comes down to personal taste. The pools were very clean although the water was cold but isn't it always in the Canaries. Plenty of sun beds so you could get a good tan. The hotel location puts it 15 to 20 minute walk from the shops etc. of Costa Teguise but it is a pleasant stroll along the promenade. We had a very pleasant, relaxing fortnight here and met some nice people.Would we go back? Strangely no. It was our first time at a Thomsons Gold Hotel and probably the last and it just seemed to lack something that would make you want to say. "that was great, lets try it again". For us it just didn't have it. Quiet, relaxing, well run but there was just something missing. Again it could just be personal choices and tastes. Hotel was great,only downside was the weather it was very wet,as the hotel has open corridors it made it very dangerous due to the marble flooring. The staff kept them as dry as possible,but there were many elderly guests that were unsteady on their feet,so it must have been scarey for them.Hotel did give a warning letter and there were lots of signs around warning of danger. Hotel is spotless,and maids were lovely. Beds are very hard,if you ask at reception you can get a topper for the bed this made a big difference. Rooms are very large with air con,but No heating. It was fairly cold during our stay. They offered more blankets for the beds.I did find it cold first thing and late at night. Entertainment was fair,I have been to other Gold Hotels and entertainment has been much better. It may have been as we had the change over from summer to winter season. All the hotel staff were lovely and friendly especially in the restaurant. I would not return to this hotel only because we are trying not to return to the same place twice. It has many guests visiting at least 3 times a year. Take a kettle with you if you have not booked a superior room otherwise their is a charge and they don't have that many. We did a free blanket trip it was alright, but only because the weather was bad if it had been sunny day time would be better spent on the sun lounger. There are cats around, they are very friendly and do not bother you. 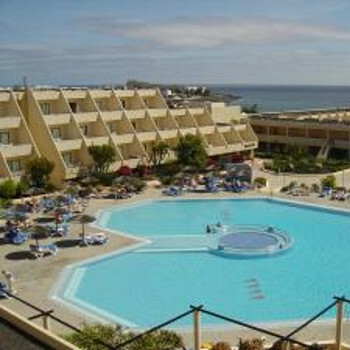 I would recommend this hotel, it was just a shame we had poor weather which is very unusal for Lanzarote. My wife and I have stayed here on several occasions and have never been dissappointed.The staff are all very friendly and nothing is to much trouble for them.The reception staff all speak fluent english.The hotel is situated in a quiet area but there are several bars and restaurants close by if you choose not to use the hotel facilities. Chose this Thomson Gold hotel 2 weeks before we went, and we were not wrong in chosing it. There are 3 words that sum up this Hotel completely they are "Brilliant" "Great" Fantastice. the entertainment was worth seeing every night, the rooms were the biggest we have ever stay in and the food was superb. Only 2 minor faults, 1, the price charged for a small 250mls of water in the resturant, hotel bar and pool bar of 1.80 Euro which many said was far too much. it was even dearer to buy a bottle of water than to have a pot of tea at 1.30. If you have a late flight home and want to stay in youyr room the charge 47 euro for this a bit over the top.But if you chose this hotel you will not be dissapointed in any way.